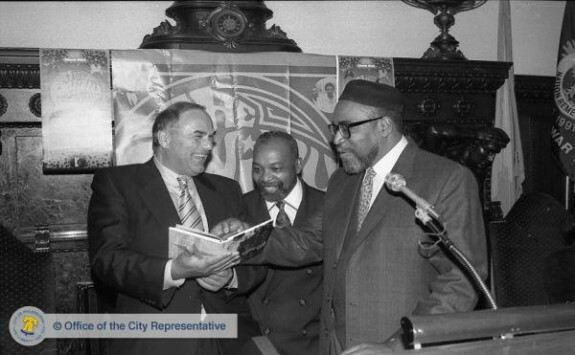 On September 30, 1997, Mayor Edward G. Rendell (left) proclaimed "Philadelphia Sound Week," which honored Kenneth Gamble (right) and Leon Huff, the songwriter/producers responsible for making the Philadelphia Sound a national phenomenon. By 1997, the duo had written more than three thousand songs and produced more than 170 gold and platinum records. In 1999, Gamble and Huff received the Lifetime Achievement Grammy. Born and raised locally, Gamble (born in 1943 in South Philadelphia) and Huff (born in 1942 in Camden, New Jersey) found success in the growing musical entertainment industry developing in the Philadelphia area. During the 1960s they wrote music for artists on Motown, Mercury, and Atlantic Records, before establishing their own label, Philadelphia International Records, in 1971. The new label gave Gamble and Huff an outlet for the music they wanted to make and helped define the '"Philadelphia Sound" for future generations. To compete with Motown’s extraordinary success in marketing black soul music to national audiences, Atlantic Records in New York and other major labels sought out three young Philadelphia-based songwriter/producers, Leon Huff, Kenny Gamble, and former Cameo-Parkway prodigy Thom Bell, who produced soul records for them at the new state-of-the-art Sigma Sound Studio on 212 North Twelfth Street, founded by former Cameo-Parkway engineer Joe Tarsia. In 1970 Columbia Records in New York created a separate soul music division, then signed an exclusive production agreement with Gamble and Huff in 1971 to write and produce records released on their own Philadelphia International Records (PIR) label. With Gamble and Huff at the helm, Thom Bell playing a key songwriting and producing role, and a core group of some thirty regular studio musicians and arrangers, PIR became the undisputed leader in soul music in the 1970s. At first, PIR had offices in the Schubert building on Broad. However, by 1973, the label was so successful, Gamble, Huff, and Bell moved into the former Cameo-Parkway building across the street. 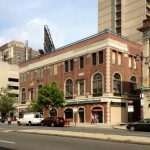 The following year, Tarsia rented space in South Broad Street building. There, he built, equipped, and operated Sigma Sound South until 1988. By 1981, the popularity of soul music was in decline, and so were record sales. In the 1990s, PIR executives restructured the company an effort to renew the label’s image, but they were never able to recapture the success they enjoyed in the 1970s, and in 2001, Philadelphia International Records closed. 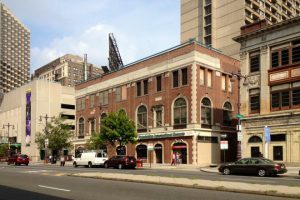 Gamble and Huff maintained offices as well as a small souvenir shop in the South Broad Street building until 2010, when an arsonist set the building on fire, damaging studio equipment and memorabilia. In 2015, the building was demolished to make way for high-rise condos. Philadelphia International was one of the nation’s most successful record companies in the 1970s, producing a long string of hits with local artists as well as out-of-towners who came to Philadelphia to capture the label’s magic. With songwriter/producers Kenny Gamble and Leon Huff at the helm, Thom Bell playing a key songwriting and producing role, and a core group of some thirty regular studio musicians and arrangers, Philadelphia International Records was the undisputed leader in soul music in the 1970s. However, by 1981 when this photograph of two Philadelphia International employees discussing album art was taken, the popularity of soul music was in decline, and so were record sales at Philadelphia International. Radio, long the lifeblood of soul, had become very restricted in its programming and no longer served as an effective outlet for the music, while other black styles had gained in popularity, including funk, disco, and a new form of urban music that was coming into prominence, rap. In an effort to renew the label’s image, Philadelphia International executives restructured the company in the 1990s. The restructuring included the addition of a hip-hop division run by Gamble and Huff’s sons, Caliph Gamble and Leon Huff II. Nevertheless, they were never able to recapture the success they enjoyed in the 1970s, and in 2001, Philadelphia International Records closed. Philadelphia had especially vibrant scenes in rhythm and blues and gospel music in the mid-twentieth century. Taking elements from each, local artists began shaping the city’s version of the emerging soul style in the late 1950s and early 1960s. Gospel was a particularly strong influence; essentially, soul was the adaptation of the gospel style to songs with secular rather than sacred lyrics. Solomon Burke (1940–2010), who began preaching and singing gospel in Philadelphia in his pre-adolescent years, made a series of recordings for Atlantic Records in New York in the early 1960s that were fundamental in defining the new style. These records were among the first to be categorized as “soul” music, and Burke was later dubbed the “King of Rock and Soul.” Other Philadelphia-area singers with strong gospel roots who had soul hits in the early to mid-1960s included Garnet Mimms (b. 1933), Howard Tate (1939–2011), and Lorraine Ellison (1931–83). While these early artists came from Philadelphia, they recorded in New York City. The larger Philadelphia record companies were more focused on rock and roll and white pop music at this time. 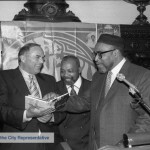 Some of the city’s smaller labels recorded local artists in the soul style, however, including two black-owned companies that were especially important in the evolution of Philadelphia soul: Harthon and Arctic. Singer Weldon McDougal (1936–2010), organist Luther Randolph, and guitarist Johnny Stiles (b. 1936) created Harthon Records in the early 1960s. Prominent Philadelphia DJ Jimmy Bishop joined Harthon briefly but broke away in 1964 to form his own label, Arctic Records, taking many Harthon artists with him. Harthon and Arctic each had a series of minor and regional hits in the 1960s, and Arctic had a huge hit with “Yes, I’m Ready,” a ballad by local singer Barbara Mason (b. 1947) that reached the Top Ten in the national pop charts in 1965. Most Arctic artists were black, but the label also recorded the Temptones, a white group featuring singer Daryl Hohl (b. 1946). Hohl later changed his last name to Hall and with fellow Temple University student John Oates (b. 1949) formed Hall and Oates, one of the most successful of the “blue-eyed soul” groups, as white soul music came to be known. Small labels such as Harthon and Arctic were incubators for the burgeoning Philly soul style of the 1960s, serving as training grounds for the young songwriters, arrangers, singers, and studio musicians who later created the Sound of Philadelphia. Among this group were two individuals who, along with Thom Bell, emerged as the chief architects of that sound: singer Kenny Gamble (b. 1943) and pianist Leon Huff (b. 1942). Gamble and Huff had been hustling around the Philadelphia music scene since the late 1950s. In the mid-1960s they began writing songs together and then moved into producing records, using Philadelphia musicians and arrangers with whom they had worked over the years. After achieving success in the late 1960s with artists such as the Intruders, Soul Survivors, and Jerry Butler (b. 1939), Gamble and Huff secured a distribution deal with CBS Records and formed Philadelphia International Records in 1971. The company located its headquarters in the former Cameo Parkway building on South Broad Street, which Cameo Parkway abandoned when it ceased operations in the late 1960s. While Philadelphia International made some recordings there, they recorded primarily at Sigma Sound Studios on north Twelfth Street, established in 1968 by former Cameo Parkway recording engineer Joe Tarsia (b. 1934). As Philadelphia International’s chief studio, Sigma Sound became a hit factory, with Tarsia serving as an important sonic architect of the Sound of Philadelphia. Philadelphia International became one of the nation’s most successful record companies in the 1970s, producing a long string of hits with local artists such as Harold Melvin (1941–97) and the Blue Notes, Teddy Pendergrass (1950–2010), Billy Paul (1934–2016), and Patti LaBelle (b. 1944), as well as out-of-towners such as the O’Jays, Jackson Five, and Lou Rawls (1933–2006) who came to Philadelphia to capture the label’s magic. With songwriter/producers Gamble and Huff at the helm, Thom Bell playing a key songwriting and producing role, and a core group of some thirty regular studio musicians and arrangers, Philadelphia International Records was the undisputed leader in soul music in the 1970s. The studio musicians had a few hit records themselves, under the band name “MFSB” (short for Mother-Father-Sister-Brother). The biggest was “TSOP” (The Sound of Philadelphia), released in 1974. “TSOP” was the theme song for the popular black TV dance show “Soul Train” and became an anthem of Philadelphia soul. With its pulsing rhythm over lush strings and slick brass, it was a typical sophisticated Philadelphia International production. The label was also known for songs featuring socially conscious lyrics with messages of unity and love. By the early 1980s, soul had run its course as a popular style. Radio, long the lifeblood of soul, had become very restricted in its programming and no longer served as an effective outlet for the music, while other black styles had gained in popularity, including funk, disco, and a new form of urban music that was coming into prominence, rap. 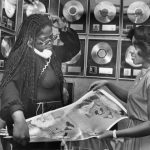 Philadelphia International Records, the last of the great soul labels, went into decline in the early 1980s, signaling the end of the soul music era. 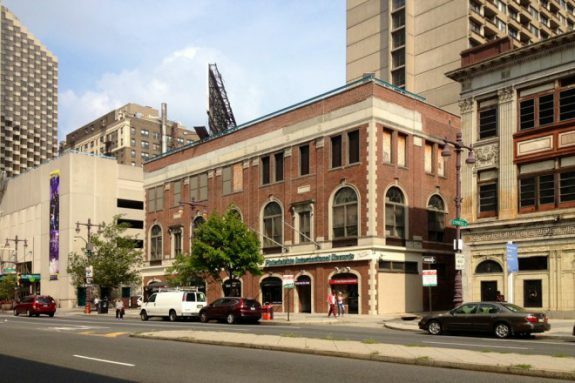 Site of Philadelphia International Records headquarters and, earlier, Cameo-Parkway Records (building was demolished in 2015; condo high-rise under construction at site in 2016), 309 S. Broad Street, Philadelphia. Site of Sigma Sound Studios, historical marker, 212 N. Twelfth Street Philadelphia. Loved this article! It filled in the gaps of Philly Soul history that I never knew. Warrington:- Part Hall/ & Soul Clubs in East Anglia /Wolverhampton /Leicester /Yate/ Bristol/London:- 100 Club/ ). At all these venues Soul Clubs were formed playing music dubbed Northern Soul :- American Rare Soul Music found on obscure independent record labels such as Arctic / Philly Groove / Harthon . All from Philadelphia also obscure record labels from Chicago :- St Lawrence :- Satellite :- Bandit :- Cadet :-‘Okeh / & from Detroit :- Drew :- Sidra :- Velgo / also New York City :- Red Coach:- Valise too name but a few . Many other American cities independents have also contributed to the phenomenon that is Rare Northern Soul….